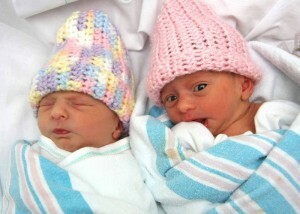 Autumn Darlene-Elizabeth Trumble and Ashlynn Darlene-Nicole Trumble were born in Oswego Hospital on June 7, 2011. Autumn weighed 4 pounds, 6 ounces and was 19 inches long. Ashlynn weighed 4 pounds and was 17 inches long. There are the twin daughters of Amanda Braley and Rodney Trumble, of Richland. Their big brother is Tyler Trumble.